When you become a parent, there are a few things friends and family are quick to give advice on: infant sleep[less] schedules, the continuous ear infections, and taking time for “you” when you can. But one thing that perplexes many of us is something that our days with small children revolve around: FOOD! While I’m not here to solve every feeding problem and issue, I’ve found a few things that work when it comes to expanding your toddler’s picky palate. I’ve teamed up with my fellow Registered Dietitian and mom, Katie from Mom to Mom Nutrition, to bring you real-life examples, nutrition basics, and tales from the trenches when it comes to feeding small children! 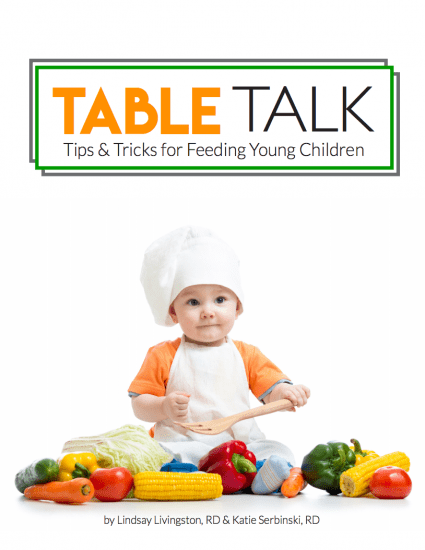 We put our mom experience and nutrition education to use to create Table Talk: Tips and Tricks for Feeding Young Children. Guess What? This is Tough Stuff! We created this e-book to share real-life stories and tips about what works and what doesn’t when it comes to raising a healthy family. This guide is meant to educate, inspire and provide support. Because feeding kids is hard. A lot harder than we’re lead to believe. And we want you to know you're not alone! Hello! My name is Lindsay Livingston and I'm a Registered Dietitian, busy mom and author of The Ultimate Guide To Food Prep. I've been sharing healthy recipes, nutrition tips and more on this healthy living blog for the past 6 years. Currently, I have a 19-month old son who I watch full-time and I also work full-time on the blog and doing nutrition communications work, all while pregnant with my second child. Hi! I’m Katie, Mom of two boys under two and a Registered Dietitian from Detroit, Michigan. I’m the founder of Mom to Mom Nutrition— a healthy food and lifestyle blog where I share my “me time” with other health-minded parents. On the blog you’ll find simple, family-friendly recipes,tips for new moms, and realistic nutrition advice. My goal is to show you that raising a healthy family is achievable, even when you have a toddler throwing food across your kitchen table and a baby wanting to nurse around the clock. “Despite having worked in nutrition and food for over 10 years before having kids, I still felt overwhelmed when it came time to feed my family. There was just so much conflicting information being thrown around and most of it didn’t really seem rooted in science or feel quite right to me. If only I’d had this book when my daughter was a baby! Lindsay and Katie’s guide is an easy-to-understand, approachable resource that inspires and encourages moms, rather than making them feel like they should be doing more. Their advice is science-based while also considering parents’ busy lifestyles and the real-world challenges we face when it comes to making meals at home. The practical tips in this book will change how you view the task of feeding your family, and will leave you feeling not only equipped but supported." 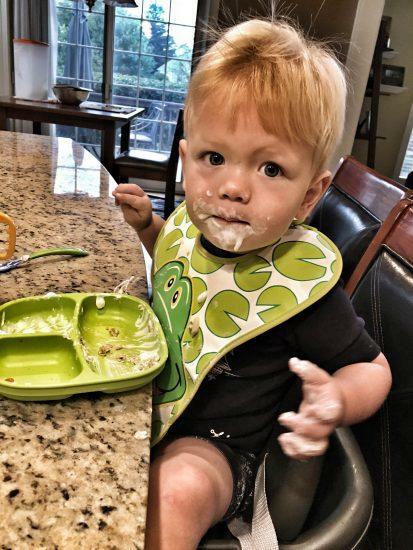 "Table Talk provides a solid overview of the most common feeding issues (and approaches) that you might face as a parent of a small child. It's a great resource to help set your kids up to become healthy eaters—and for us parents to stress less when feeding our families."